This Recommended Practice is a vital first step for the selection of electrical systems and equipment for safe use in Class II hazardous (classified) locations in accordance with the NEC®. 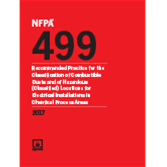 Up-to-date with NFPA 70®: National Electrical Code®, the 2017 edition of NFPA 499: Classification of Combustible Dusts and of Hazardous (Classified) Locations for Electrical Installations in Chemical Process Areas presents criteria to determine ignitability hazards in chemical process areas where combustible dusts are produced, processed, or handled. Make sure you can properly select and install electrical systems and equipment for safe use in Class II hazardous (classified) locations. Filled with detailed guidelines and diagrams, NFPA 499 also provides extensive data on physical properties of selected combustible dusts, including specific Class II, Division, and dust group information. It's an important tool for anyone who performs hazardous (classified) area classification. 1.4 Relationship to NFPA Codes and Standards. 4.3 Additional Potential Combustible Dust Hazards. 4.4 Classification of Combustible Dusts. 5.1 Classification of Class II Hazardous Locations and National Electrical Code (NEC) Criteria. 5.2 Classification of Combustible Dusts. 6.2 Conditions Necessary for Ignition of Combustible Dust. 6.3 Class II, Division 1 or Zone 20/Zone 21 Classified Locations. 6.4 Combustible Dust, Class II, Division 2 or Zone 22, Classified Locations. 6.6 Procedure for Classifying Areas. 6.8 Extent of Hazardous (Classified) Locations. 6.9 Discussion of Diagrams and Recommendations.